Knives are by far the most important tools in your kitchen, and handling them properly is essential. These basic knife skills will teach you how to break down some of the most-used food items in the kitchen. When it comes to knife skills, practice makes perfect. Start slowly and soon you’ll be increasing your speed and improving your results. Three words: planks, sticks, cubes. If you can remember those words, in that order, you will be in great shape to cut almost any item down to whatever size a recipe calls for. 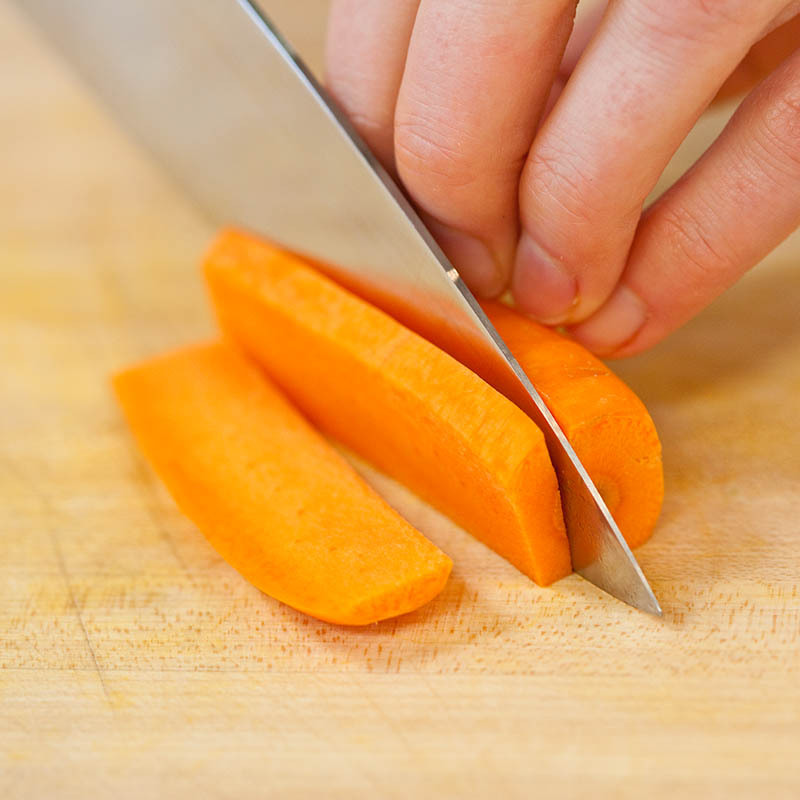 If working with a round item like a carrot, cut crosswise into two or three pieces that will be easier to work with. Then remove a thin sliver from one side to create a stable edge. Place the food cut side down and cut the item lengthwise into even planks. Depending on the item, stack as many planks as you feel comfortable working with, whether it’s two or as many as five. Then cut the planks lengthwise into even sticks. Next, create the diced shape by gathering the sticks together, and cutting them crosswise. Keep the spacing even. Hold the sticks with your non-knife hand; curl the tips of your fingers under and extend your knuckles so they can guide your knife and keep your fingers out of danger. Dicing an onion follows this same procedure of “planks, sticks, cubes.” But in this case, all the planks and sticks are still attached to the root end. Step 1: Make several parallel cuts to create planks Peel the onion, then make several horizontal cuts from one end of the onion half to the other, stopping just shy of the root end. The number of cuts—and planks—will depend on the size of the onion and the desired size of the chop or dice. For minced onion (smaller pieces), make cuts that are close together; for chopped onion (larger pieces), space the cuts further apart. Step 2: Cut from pole to pole Cutting from pole to pole turns the onion planks into sticks. Make several vertical cuts, being careful not to cut all the way through the root end with the tip of your knife. Step 3: Slice across the cuts Now it’s time to turn the sticks into cubes. 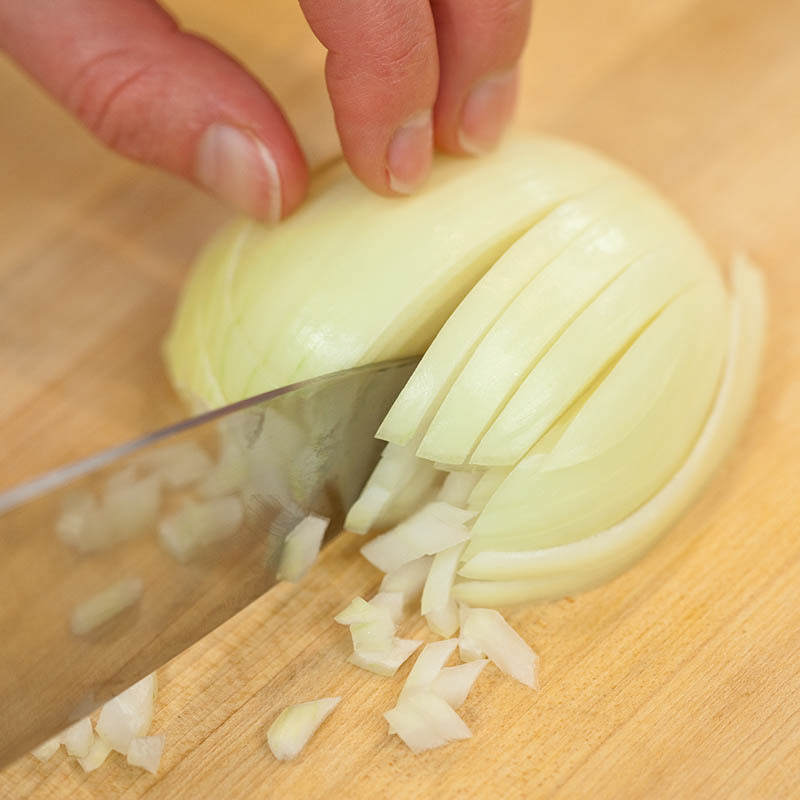 Using your knuckles as a guide for the knife while holding the onion with your fingertips, slice across the sticks. For more control, pull your fingertips in towards your palm, extending the knuckles outward when cutting. The process for chopping herbs differs from the planks, sticks, cubes method above. Instead of more refined cuts, chopping herbs uses a rocking, pivoting motion. Step 1: Remove thick stems After the herb has been washed and dried, pinch the leaves to separate them from the stems. To remove many leaves from the stems, hold several stems upside down, and run a chef’s knife down stems. The leaves should come off easily. Don’t worry if thin stems come off, too. On tender herbs like parsley and cilantro, these thin stems near the leaves have a lot of flavor. Unless you need whole leaves for garnish, include the stems when you chop. Always discard the thicker, woodier bottom portions. Step 2: Use both hands and a rocking motion: Pile the leaves and thin stems up on a cutting board and use a rocking motion to chop them with a chef’s knife. Rest the fingers of your non-knife hand lightly on the spine of the knife to help maintain the up-and-down rocking motion needed for quick chopping or mincing. To make sure the herb is evenly minced, pivot the knife as you chop. The best way to perfect your knife skills is to practice every chance you get. Fortunately, you only need a few pieces of basic equipment to do that. 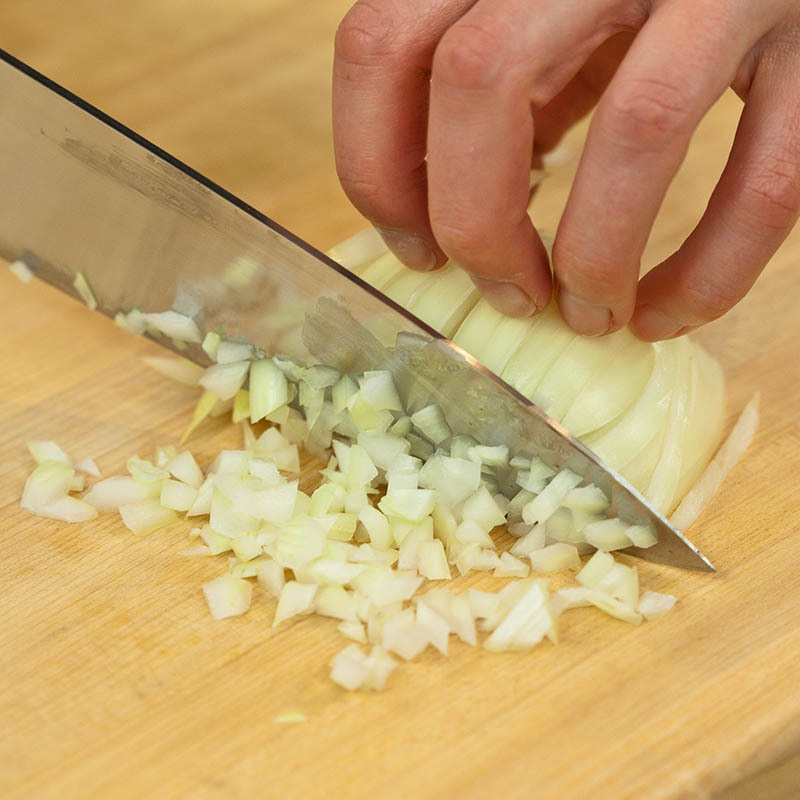 Chef’s knife: We use this knife for everything from chopping an onion to mincing herbs. With its pointed tip and slightly curved blade, this knife will handle 90 percent of your kitchen cutting work. Paring knife: The small blade of a paring knife allows you more dexterity and precision than a chef’s knife can provide. Reach for a paring knife for jobs that require a bit more accuracy and exactitude. Its small, pointed tip is also great for testing the tenderness of meat or vegetables. Cutting board: The ideal cutting surface is soft enough to keep your knives in a good shape but sturdy enough to absorb significant abuse. Choose a board that is 5 pounds less. We like cutting boards made of wood best, but plastic works well, too. Wooden boards must be washed by hand. What does it mean when a recipe calls for a “dice”? Knowing how these terms correspond to size will guide you through your recipe prep.